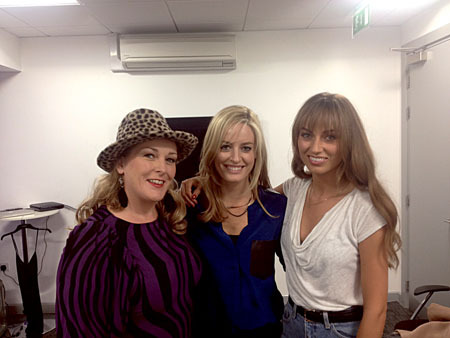 Pictured on Celebrity Apprentice — You're Fired are Dr Lisa Creaven (Quay Dental), and participants Katherine Lynch (Aka Sheila Chic from Wagons Den) and model Danielle Moyles. The Clearbraces group comprises eight dental practices across Ireland that are the primary suppliers of Invisalign orthodontic therapy. Invisalign is an innovative and patient-focused treatment that is fast becoming the replacement for traditional fixed braces, more commonly known as ‘train tracks’. Invisalign is an invisible and removable brace, requiring no metal, wires, or brackets, which is designed to fit comfortably over a patient’s teeth, which over time is proven to perfectly align the teeth. The treatment uses state of the art computer technology to straighten teeth, providing a modern and affordable solution to many dental problems and conditions. The brace resembles a clear retainer which is changed every two weeks, gradually improving and straightening a patient’s teeth. The process of the treatment typically lasts anywhere between six months to a year, depending on the patient and the condition. Prior to joining the Clearbraces group, Lisa Creaven’s Quay Dental practice was the biggest provider of Invisalign products in the west of Ireland, and one of the biggest in the country. Ms Creaven was approached to become the official supplier of the treatment in Galway as well as becoming a full-fledged member of the group, which was established three years ago. She has since become the main supplier of Invisalign products to Limerick. This week, Lisa Creaven appeared as a representative for the Clearbraces group and the Invisalign brand on the aftershow of the popular programme Celebrity Apprentice on TV3. On the semi-final of the main show, celebrity contestants were given the task of creating a television advert that accurately conveyed the message of Invisalign. Ms Creaven featured on the Celebrity Apprentice: You’re Fired show, hosted by presenter Anton Savage, as a special guest expert and panelist. Invisalign will be launching a nationwide promotion on November 2 at each of the eight official providers, including Quay Dental here in Galway where people can find out more about the treatment and avail of excellent discounts on the price of Invisalign braces. Have you always wanted straight teeth but do not want traditional braces? Clearbraces.ie have the answer! Page generated in 0.1974 seconds.